"Just because it doesn't swing for a while doesn't mean it won't swing"
From the top of the ticket to the bottom, the Democratic Party swept all three statewide races in Virginia on Election Day. Former White House strategist Steve Bannon dismissed concerns about Republican Ed Gillespie's loss, saying Wednesday night on Fox News that the Commonwealth is a "blue state" now. But other political analysts told News4 they believe Virginia is still very much a swing state. "The best measure of a swing state is whether both parties think it's viable," says Stephen Farnsworth, a political science professor at the University of Mary Washington. Democrat Ralph Northam handily won the hard fought Virginia governor's race over Republican Ed Gillespie, a contest watched across the country as an early referendum on President Donald Trump, NBC News reports. New4's Justin Finch spoke to voters about why they went to the polls Tuesday. Farnsworth says Virginia's diverse population is what makes it such a competitive state during election cycles. "What you have in Virginia is a distinct culture compared to other Southern states. There are a lot of people that come to Virginia from other states, so messages about Confederate statues won't work as well here as in Georgia," Farnsworth said. And it's that electoral competitiveness that makes Virginia a swing state, not its recent trend of being a blue-leaning state. Electoral competitiveness is the product of having about the same amount of partisan voters in the electorate and depending on independent voters to settle the race. "Pennsylvania and Wisconsin have always been covered as battleground states despite them voting blue, but 2016 was the first time they actually swung," said Rachel Bitecofer, the assistant director of the Wason Center for Public Policy at Christopher Newport University. "Just because it doesn't swing for a while doesn't mean it won't swing." 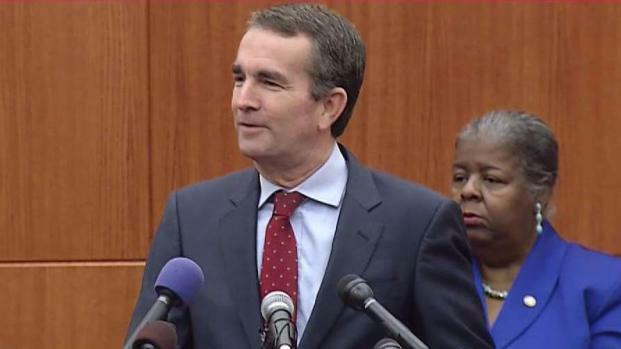 Bitecofer and Farnsworth say the Democratic Party's win in Virginia was not a surprising one given the current political atmosphere. "The Republicans historically have been investing a lot in Virginia in presidential years and gubernatorial years," said Farnsworth. "I think what you saw in Virginia on Tuesday is a reaction to Trump." Ralph Northam jumped right into his agenda the day after he was elected Virginia's new governor, saying he promises to stand up to President Trump on issues such as immigration. 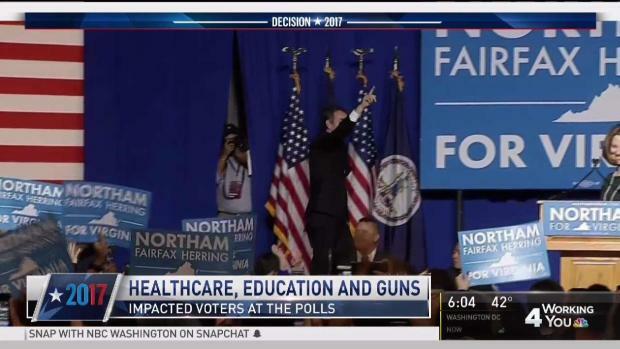 News4's David Culver reports Northam explained how he hopes to win over the people who voted for his Republican opponent. Virginia is the only Southern state President Donald Trump lost last year. "The signs of a wave have been there for months," Bitecofer added. "More voters participated in the Democratic primary, the Democrats fielded an unusual amount of candidates, they had more volunteers, money." Both Farnsworth and Bitecofer agreed that if Hillary Clinton won the 2016 election, Gillespie may have had a better chance of becoming Virginia's next governor. "The real enthusiasm would've still lied with the Republicans," Bitecofer said. "This is the type of condition in which you expect Democrats to make gains." Virginia was solidly red until 2008, when it became a battleground state. "During the 60s, 70s, 80s and 90s, there was very little invested in Virginia as far as presidential campaigns," Farnsworth said. "Lyndon B. Johnson won the state in 1964, and after that, Democrats didn't win the state again until Obama in 2008." Farnsworth said some states, like Florida, are perennial battleground states. But Virginia has only been tightly contested for the past three election cycles. "The best guess on whether Virginia will remain a swing state is whether the Republicans invest a lot of money in the 2020 election," Farnsworth said. Farnsworth said he thinks Virginia is moving in a "bluer direction," but it's definitely still a "purple state." "Beyond 2020 we'll see, but at least for the next election cycle, Virginia will be very competitive," Farnsworth said.